When I was younger, the term supermodel only referred to a select few in the industry- Cindy Crawford, Naomi Campbell, Heidi Klum, Claudia Schiffer, Elle McPherson, Kate Moss, and more recently, even Miranda Kerr. Everyone else was just a model- they hadn’t yet received the superstar status that saw them on the catwalk for exclusive fashion designers or gracing the covers of fashion bibles like Vogue magazine. Their names, faces and bodies were not recognised internationally and on such a grand scale that they could be mentioned by their first name only and everyone would know who the subject of conversation was. But with a new generation comes a new wave of supermodels gracing our magazine pages and fashion runways. With the help of social media and divergent pathways within the industry (film and television, for example), new names such as Cara Delevingne, Kendall Jenner, Karlie Kloss and Suki Waterhouse are making their presence felt. While I wouldn’t yet put them in the same category as the above mentioned models, they certainly are starting to become familiar names- enough so that they can contribute to a little book called Supermodel Tips. 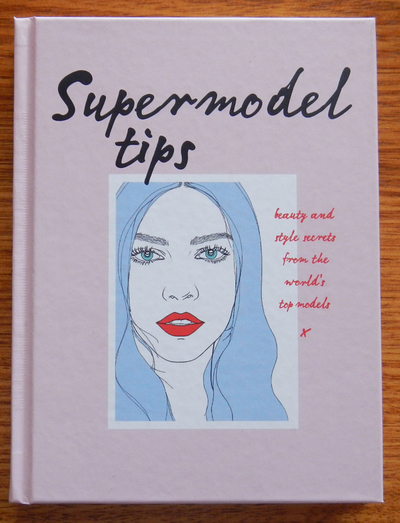 This little tip book showcases advice from both generations of models, with more of an emphasis on the current supermodels in circulation. I can only assume that this is to appeal to a younger, newer audience. Separated into sections covering make up, fashion, skincare, hair, body, confidence and lifestyle, this book provides tips from the world’s top models to help make yourself a better you. Hints and tips from the author (a make-up artist, tanner and beauty writer) are interspersed with attributed tips from the models themselves, with a few pretty fashion illustrations by Montana Forbes thrown into the mix. Perfect for the fashionista in your life, this is a handy little fashion guide for those who want to live and look like a supermodel.